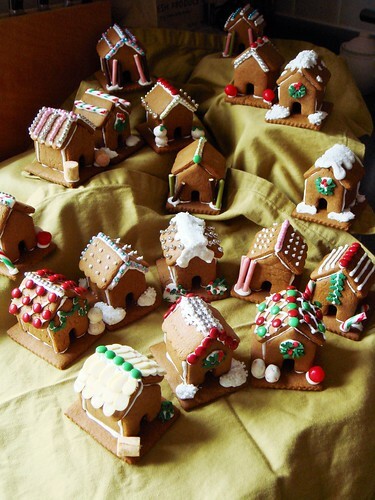 I used a few gingerbread recipes in the past but I wholeheartedly agree with smitten kitchen that Martha knows best. 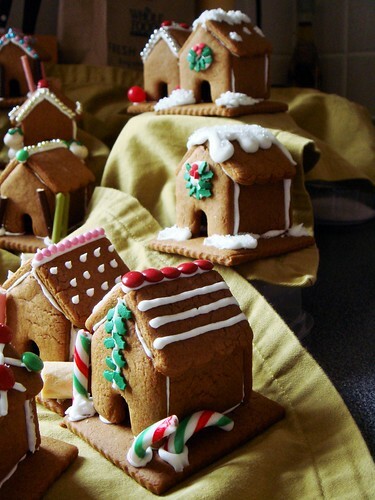 Her spicy gingerbread cookies recipe makes a huge batch with an equally big kick of warm spice. Best of all, the dough is easy to roll out and maintains its shape nicely during baking. The baked cookies tasted crisp yet a little toothsome. It was great building and snacking material. 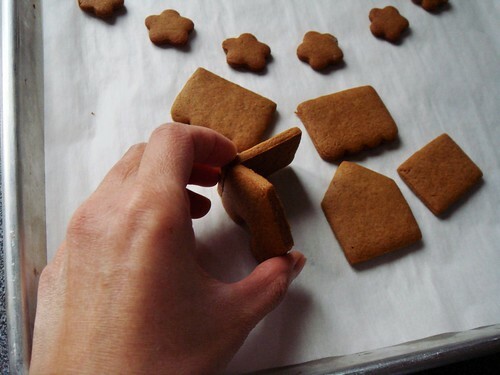 Royal icing (recipe also from Martha Stewart) is the glue that holds a gingerbread structure together. I made mine using meringue powder instead of raw egg whites to minimize risks. Building the houses was not at all complicated. The cookie cutter took care of six panels including four walls and two roof pieces. I also cut out 2 1/2 x 3 inch rectangles for the base of each house. 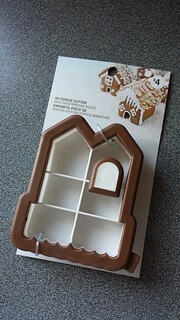 For assembly, I started by gluing the four walls together with royal icing and then attached them to the base rectangle. 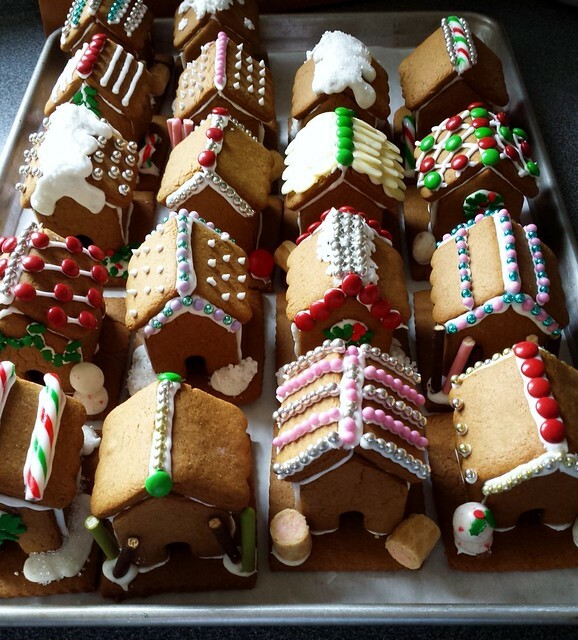 The roof covered the top and I reinforced the ridge with a big fat line of icing. After that, it was time for some fun and creativity with decoration. I did not have a lot of time to shop for decorative candies but what I could get my hands on, they worked well. I used a variety of metallic dragées, seasonal quins, mini M&Ms, Pockys, Collons, peppermint covered pretzel balls, red sour candies, sliced almonds, and of course mini candy canes. 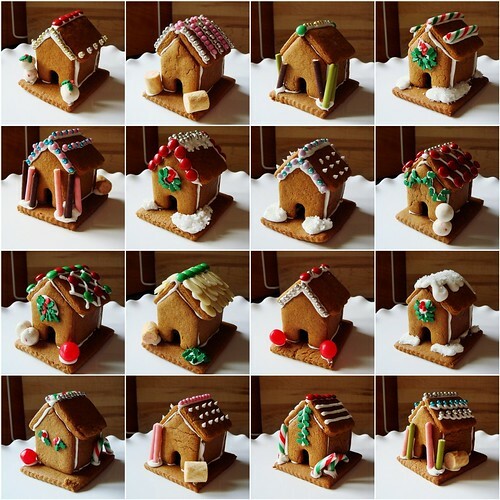 Take a look at all the different designs I got out from this handful of ingredients! 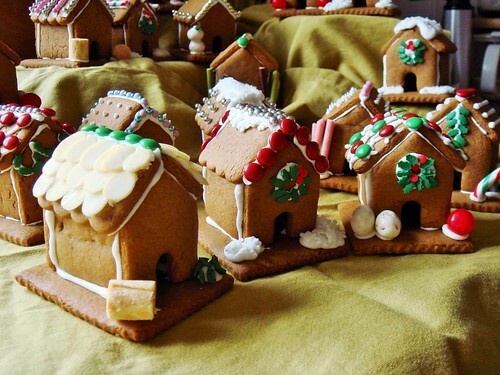 With 18 unique mini houses to play with, I created a diorama of gingerbread mountain village. 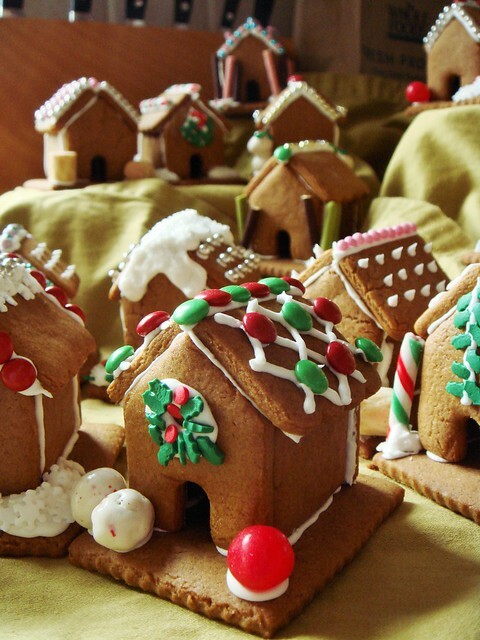 This can easily be an attractive centerpiece for your holiday dessert table without the structural challenges that typically come with building large gingerbread houses. 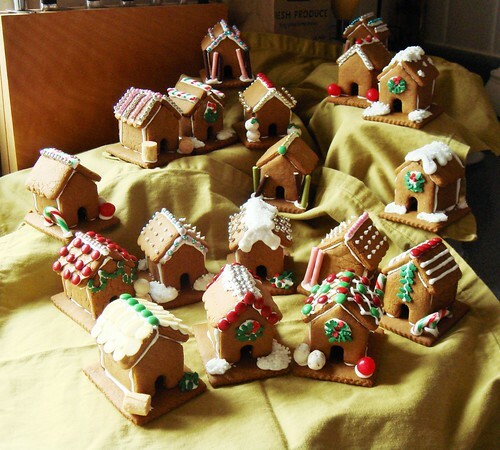 Alternatively, you can attach a loop of string to the house and have a lovely collection of tree ornaments. 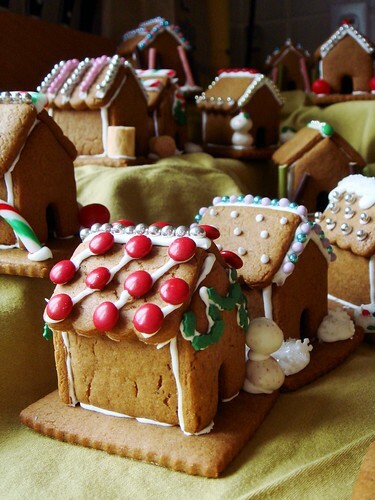 The great thing about gingerbread is that they stay fresh for weeks. The fragrant spice mallows out but the cookie continues to taste amazing. Needless to say, they were a huge hit at the cookie swap. 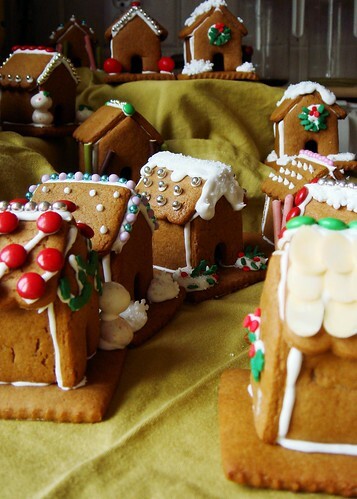 I will leave you with photos of the gingerbread village. Now I am feeling festive!